Mickey Mouse is an adorable part of American culture and has been for many years. 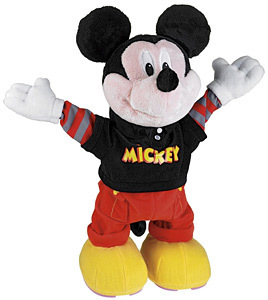 In comics, on the screen, as a plushie, and as a toy, Mickey Mouse is recognizable and beloved. Then there are action toys: toys that do things like make music, dance around, and sing. Mickey has all that and more. Dance Star Mickey interacts with children to be their companion and friend in singing and joke telling. He is a funny character with all of the things that he can say - a master of different moves for different grooves.